Six cars were built at Islington between 1905 and 1907. The internal layout of the cars was similar to other Short Tom cars, being divided into two compartments, fitted with logitudinal seating, divided by a partiton fitted with two lavatory compartments. First class Short Tom 31 foot 6 inch lavatory bogie carriage built at the Islington Workshops. 22.4.1905 Issued to the northern system as first class car seating 26 first class passengers to replace an original 4 wheel car of the same number. - Fitted with electric light, westinghouse brakes and end platform walk through. 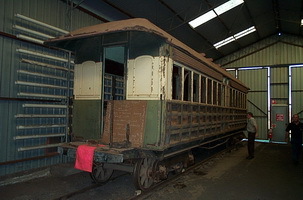 - Used as a rail car trailer in green and cream livery. - Sold to a Farm near Terowie. - Sold to Pichi Richi Railway. Second class Short Tom 31 foot 6 inch lavatory bogie carriage built at the Islington Workshops. 10.5.1905 Issued to the northern system as second class car seating 26 passengers to replace an original 4 wheel car of the same number. Second class lavatory carriage, 36'1" in length, fitted with longitudinal seating. 1917 Transferred to Port Lincoln. 13.8.1970 Condemned at Port Lincoln. 10.1906 Issued to the south-eastern system as composite class car seating 26 passengers. 1938 Fitted with special brakes for working with rail cars. 1943 Special brake gear removed and transferred to Freight Brake Van 5568. 18.11.1907 Issued to the Port Lincoln system as second class car seating 26 passengers.